MAKTrek TECHNOLOGY – Our top selling Probiotic features the MAKTrek patented stomach acid protection and delivery system. This can allow strains to survive stomach acid and reach deep into the small intestine to support a healthy gut. Our advanced strength formula can even reach your large. PROFESSIONAL GRADE & DEVELOPED BY DOCTORS – Our industry leading capsules are formulated with a patented combination of Probiotic strains and CFU’s containing Lactobacillus Acidophilus Plantarum Paracasei and Bifidobacterium Lactis among others. DIGESTIVE HEALTH & IMMUNE SYSTEM SUPPORT – Replenish the beneficial bacteria to improve digestive and immune health, support more vitamin production and promote daily relief. DAIRY & GLUTEN FREE, NO REFRIGERATION REQUIRED & MADE IN USA – Our unique Probiotic supplement is manufactured in the USA in an FDA and GMP, state-of-the-art facility. Every batch is third party tested to ensure the ingredients are safe, pure and potent. We pride ourselves on our superior ingredients. GUARANTEED POTENCY UNTIL EXPIRATION DATE – Beware of probiotic supplements that don’t guarantee potency all the way to expiration as strains can be dead by the time you buy the probiotic. 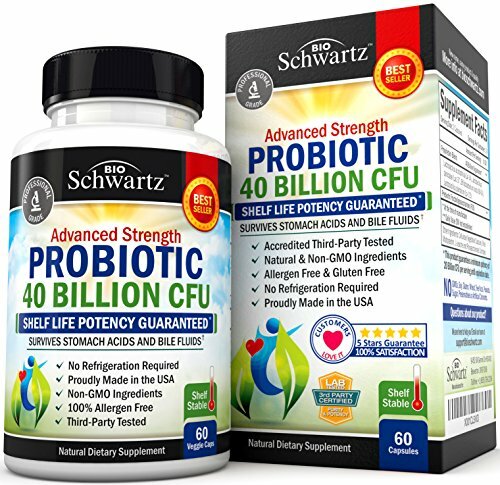 BioSchwartz Probiotics guarantees that strains will be ready to work through expiration.